Every kitchen needs a fan, some more than others. If you fry a lot of foods, the smell that lingers on in the kitchen can reveal your dining habits for far too long. Nobody likes to be thought of as a junk food master, so luckily those damning smells can be whisked away on an air current. Cutting a hole in the ceiling for a range hood vent is not always an option, but a fan sure is. 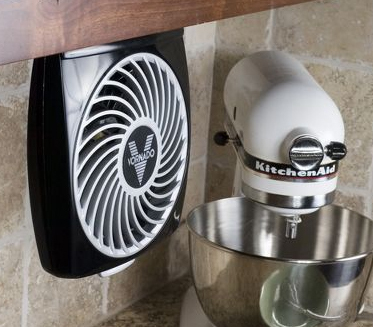 The Vornado Foldaway Under Cabinet Fan installs easily and swivels in any direction, offering a simple solution to chasing away unwelcome smells. An attractive alternative to a bulky standard fan, the under cabinet installation has the added benefit of folding away out of sight when not in use. Those pounds put on from all that fried food however, well, those might be harder to hide.